There are two new options “Check for Updates and Notices…” and “Download Software Update…” available under the help dropdown menu. See details below. Requirement: You must have active internet connection to use the below features. Action Required: Please note you only need to download the new version if it is greater than your installed version number. This will display the current installed version number of FarmBooks. Please note this version number. It will prompt you if you want to continue to the website to determine the latest version available for download. If no farm database is open, the download process will obtain the farm number by reading the first record from the registration database. If a farm database is open, then the current open farm number will be used to determine the user's eligibility to download the software. Only users that are current with their yearly maintenance will be permitted to download the software update. If you receive an error when trying to obtain the update, inspect the areas highlighted in yellow in the sample log below to determine your course of action. Is the farm number correct? If not, then open the correct farm database and retry. If you see the authentication type  failed and Error 114, first check that you have an active internet connection. 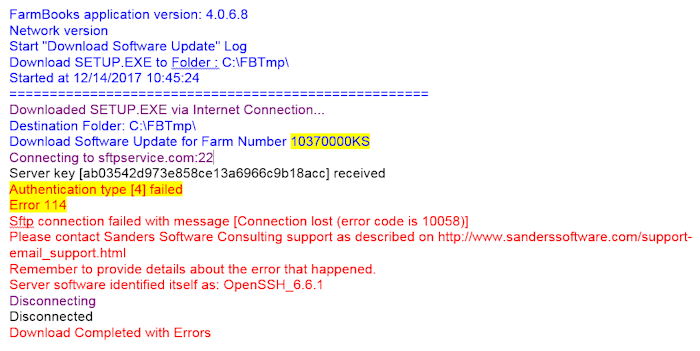 If you can open a page on the internet, then contact Sanders Software Consulting, Inc at 785-865-5111 to determine the status of your maintenance.